For complete peace and relaxation, there cant be a better option for you than this budget-friendly hotel. You can take a dip in the stunning swimming pool for some relaxation. The rooms are spacious and clean and if you wish to order room service, it is available till 11pm. 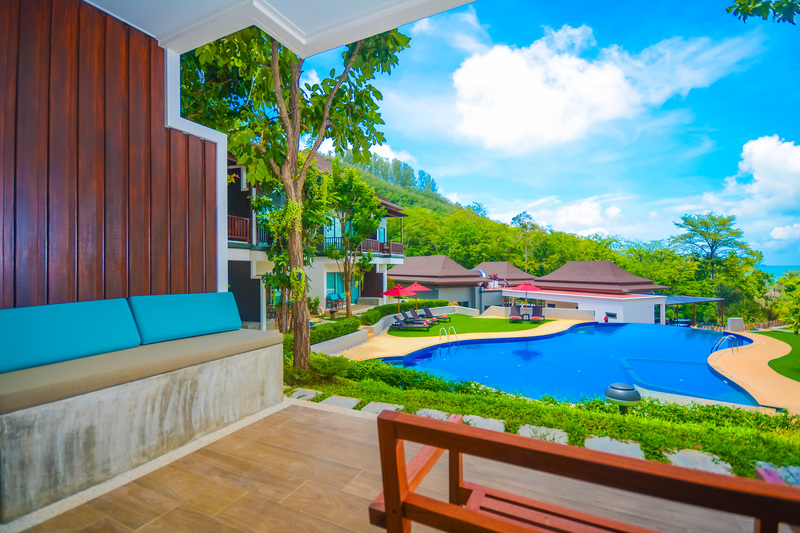 Crystal Wild Resort Panwa Phuket is a 4-star resort located in the southern part of the Phuket, along with the Panwa beach, at a distance of 32 km from the Phuket International Airport. The resort is situated on the hillside surrounded by the peaceful forests of mangrove and lush tropical gardens which makes it a perfect honeymoon getaway. The Crystal Wild Resort Panwa Phuket is a perfect destination for all those who are tired of the city life and daily routine and want some peace in life and want to soak themselves in the beauty of nature. The guests over here can also enjoy the breathtaking views of sunset and views of Panwa Beach and Chalong Bay from their rooms will leave them mesmerized and spellbound. All those who want a flavor of spirituality added to their trip can visit the Wat Chalong Buddhist temple, which is just 11 km from the resort. The Crystal Wild Resort Panwa has 24 rooms which also include luxury pool villas, the categories in which these rooms are offered are - Deluxe Room with Garden View, Superior Deluxe Room, Deluxe Family Room, and Premium Deluxe Room. The rooms are pretty spacious and comfortable, equipped with air conditioner, flat-screen satellite TV and seating area from where the guests can see the beautiful view of Panwa Beach and sunsets. The resort also provides for an electric kettle, a mini-fridge in the room. All the rooms have free Wifi and room service staff is always available for fulfilling the demands of the guests. The guests at Crystal Wild Resort Panwa, Phuket will get to experience some really great facilities like the sea blue swimming pool where guests can dive in to refresh and rejuvenate their senses. They may also visit the fitness center which gives an option to carry on with their fitness regime. The resort also provides free Wi-Fi all over the area and it also has an airport shuttle to make sure that its guests face no problem in reaching the resort. The rooms are beautiful and spacious and spending time in such rooms can provide mental peace. The dining at Crystal Wild Resort Panwa, Phuket is not just a unique but also a healthy experience as it is ensured at the restaurant that all the dishes served are good for health. The resort has one restaurant Kng Kng Restaurant and it serves not just the best of Thai food and seafood but it also has a big range of dishes from international cuisine. The restaurant serves a breakfast buffet from 6:00 am to 10:00 am, lunch can be ordered by the guests from 11:00 am to 3:00 pm while the orders for dinner can be given between 6:00 pm and 9:30 pm. No order is taken after 9:30 pm and here the guests can also enjoy cocktails and wines with their food. With such great surroundings, tasty food and drinks and lovely rooms, it is quite obvious that the stay at Crystal Wild Resort Panwa of each person is going to be awesome and lifetime experience. In addition, the resort also offers the facility of meeting center and fitness center and the staff is also well-trained and soft-spoken. How far is the resort from the international airport? The Crystal Wild Resort Panwa is almost 45-60 minutes drive from the Phuket International Airport and the resort does provide an airport shuttle for its guests. What the places to visit around the resort? The guests can have a great time enjoying the beauty of Panwa beach while they can also visit the Wat Chalong Buddhist temple which is nearby. Other attractions where the guests can visit easily are Khaokhad View Tower, Phuket Zoo, Saphan Hin Mining Monument, Phuket Aquarium and many other locations. No, the breakfast is not included in the price but there are many mouth-watering delicacies which are offered by the restaurant. The restaurant does serve breakfast as buffet spread giving the option of having Thai food or any other food from international cuisines to the guest. What are the room options at the resort? The room options that resort offers are Deluxe Room with Garden View, Superior Deluxe Room, Deluxe Family Room, Premium Deluxe Room. What other facilities does resort offers? The resort offers the facility of a game room, luggage store, tour desk, fitness center and meeting center to its guests. At Crystal Wild Resort Panwa, Phuket, the guests get a holistic experience as on one hand they live in the luxurious environment of a 4-star resort while on the other hand, they feel oneness with nature. While they have the option of choosing a wine from a big range of wines available, they are also provided with the chance to eat fresh and healthy food. Their rooms are equipped with all the luxuries but from there, the guests can also have a beautiful view of the sunset or Panwa beach. If one is looking for a vacation to relax their senses and spend some time among nature then this is the place to be. Guests are sure to enjoy their time here and leave with some very fond memories of their stay. Away from the hustle and bustle of the city, this hotel gives its guests a natural and heartwarming experience.